Heartbreak. As adults, we’ve all suffered through the ache of a love suddenly, irrevocably absent. We remember the tears that would not, could not quickly subside – the emptiness a friend, pet or sweetheart once so tenderly filled. For many people, especially those past 25, it’s universal. Not so for the kids who read us. And that’s so important to remember. It sounds like I’m about to praise YA romance, not nonfiction, but bear with me. I’m late with my contribution because my youngest daughter, 22, just had her heart shattered, and I’ve spent my writing hours trying in vain to comfort her. My arms have been away from the keyboard, wrapped around her shoulders. My fingers have combed through her tear soaked hair, ignoring the beckoning keys of my laptop. My heart has been broken, too. As I have tried to say something worthwhile, beyond, "I love you," the only thing I’ve come up with is, “You’ll be a better writer for it.” She already writes circles around me, on her sunnier days. It’s lame advice, I know…especially in the height of this reign of destruction. But it is also true. And it is vastly important for all writers to remember. 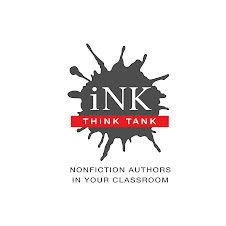 We may be intimately acquainted with pain, but the kids who pour through our pages might not be. So when we tell our true stories, it’s important to be thoughtfully honest. The loss we represent, and the survival that goes along with it may be a child’s first point of reference, when real pain finally strikes. When I wrote SAVING THE BAGHDAD ZOO for HarperCollins/Greenwillow a few years ago, I had to consider that kind of writing. As I reviewed 7,000 photographs my subject and later writing partner William Sumner had taken while he was deployed in Iraq, I came across autopsy pictures of a dead Bengal tiger. I cried as I looked at each bloody image, grieving the loss of such a magnificent creature. It was even more crushing to know it was an American soldier that fired the fatal shots. And I wondered…how much should I share? Clearly, the photos of bullets in blood soaked hands weren’t appropriate for a photo essay for kids 9 and up. Including those images was never a consideration. But I struggled with writing about the tiger at all. Then I remembered how I learned compassion and tenderness, long before I grew up. I learned through my mother and father, of course. But I also learned by reading books. The ache of Charlotte’s death, as Wilbur wept; the depths of despair in Black Beauty – these stories taught me how it feels to experience loss. And they gave me comfort when my first brushes with real life pain finally arrived. Books – fiction and nonfiction -- remind us, we are not alone in our sorrows. And they give us hope that we, too, will survive. Writing about the death of a tiger who had survived starvation only to be gunned down a year later was painful. 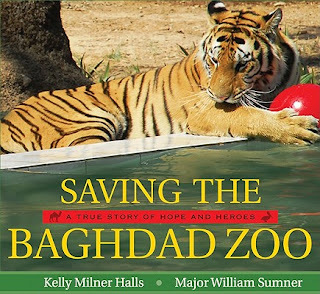 Writing about the two tigers the U.S. Army later gave the Baghdad Zoo in a gesture of apology and friendship, helped ease the sting. Knowing new tiger cubs soon populated the war torn zoo gave me a sense of hope. Will those honest depictions sow the seeds of comfort in generations to come? I believe they might. I hope they will and I think it is important to try. My daughter grew up reading great stories, true and fictional. She witnessed the joys and sorrows of others in thoughtfully written text, and now she’s joined their ranks. I hope, when she felt my arms around her, she felt their arms, too. I hope as we write, we offer our readers the most universal truth of all – none of us is ever truly alone in our pain. All of us have the hope of better things to come. I hope we tell the biggest truth, as gently as we can. I love you, Kelly. Your kind heart will see your beautiful daughter through and she WILL be a better writer for it. Joni MItchell wrote that "Sorrow is so easy to express and yet so hard to tell." But you did, Kelly, most eloquently. Kelly, this is an incredible post. Thanks for it, and for the books you create for kids. Thank you so much, Juliet (my Chautauqua friend), Cheryl (who I will see soon in Missouri), Annalisa and Sandy. Your words mean so, so much to me.